UPDATE AT OPEN 8-3-2012: The SP500 Index has reversed the breakdown in just one day and is now back in the breakout area it was in before the ECB’s Drahgi dragged the market down yesterday. 1380.39 is support now, which is the 7-29-2012 high. 1391.74 is the recent high that represents the next breakout point. Closing above that 1380ish number would be positive and good for a day’s work. The reaction to the minimal uptick in the unemployment rate which was almost a rounding error was slightly positive, not negative. Most of the gains are attributable to European hope that Spain will receive the help it needs on its debt to state it succinctly. The world must now see that the Europeans are serious about saving the Euro and strengthening their economies. 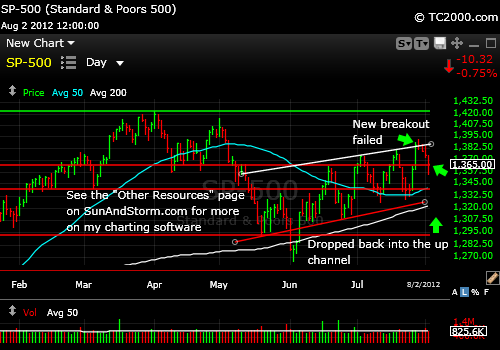 SP500 Market Timing Chart for 8-02-2012 Close showing failure of breakout. UPDATE AT OPEN ON 7-31-2012: The SP-500 Index remains at breakout levels above the prior July high. The rest is below. Watch for any reversal of that breakout by the way as you may need stop loss points on trading positions. The Fed announcement tomorrow is not supposed to say anything new according to most. Watch for that on Wednesday. The hope is that the ECB will take the heat and the lead this time. James Bond joined forces with the Queen of England Friday night, but last week bond sellers joined forces with stock buyers! Finally, the winter of our discontent is lifting with an 8.89% increase in bond yields in one day! That’s a WOW! [UPDATE: This moderated a bit with a rally in bonds on Monday, but it’s headed in the right direction so far as the reversal above the 6-1-2012 low in yields is still intact.] This is great news for stocks because it implies a continued rally for stocks. The very low yields we were experiencing were a reflection of a market gripped by fear. Be sure to take some off the table if you are overexposed in bonds right now. This bond sell-off could continue for a while. Even the Bond King, Bill Gross, has said bonds just don’t pay enough. He tweeted that last weekend. The VIX? It can now fall all the way to the 2011 low (which is a bit higher) or to the March 2012 low in this move. The NASDAQ 100 is at resistance still fighting the triple tops largely due to the heavy influence of Apple stock (APPL) on the index. Apple has a “delay of purchase” problem this quarter as their version 5 model iphones are not due out for a while and it is causing customers to delay purchases. The Android software is functionally outperforming that of the iphone at this point according to some. A phone company rep told me he had to “hack” his iphone to get it to do what he could have had an Android do without any problem. Steve was always big on “control,” despite his brilliance. So Android phones may eat Apple’s lunch at least until the next iphone is released. This will pressure the NDX (QQQ). The Bull argument at this point is that AAPL is just above the 50 day moving average, and could gain some strength. It did not continue to break down on Friday. The point? Apple weakness explains why the NASDAQ and NDX did not move up with the SP500 Index on Thursday and Friday. This entry was posted in gold, gold etf, investment, Market timing, pharmaceutical stocks, S&P 500 Index, trading, Treasuries and tagged drg, gld, gold etf, market timing, qqq, sp500 index, spx, spy, US Treasuries, xph. Bookmark the permalink.